Packets are sent and received in AX.25 UI frames at 1200 baud. This allows operation on the VHF APRS network. The Radio Shield 2 replaces the original Radio Shield and comes pre-assembled, except for the pin headers that connect it to the Arduino. The interface is unchanged. Further documentation will be posted soon. Check parts list to ensure you have all necessary parts. Locate part locations on PCB next to their silk screen labels. Begin by inserting lowest profile parts and soldering into place first, working up to the taller pieces. Resistors (R1-7, R9-13) - R6 is *not* needed for Kenwood and Chinese import radios, do not install if it is not needed! Crystal (Y1) - be sure to fold crystal over as seen in photo. Program Arduino with sample code from below, connect radio and insert shield to Arduino. Ensure that jumpers are on RUN side of pin header. For hand-held radios that don't have a separate PTT line (most makes and models except for Kenwoods and Chinese imports) install the provided 2.2k resistor (red-red-red color code) in position R6. Keep both JP7 jumpers in RUN position for communication with Arduino. Use PROG position for serial pass-through to shield. 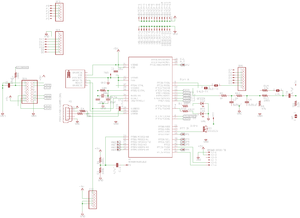 Remove jumpers (or the entire shield) when programming the Arduino board. All serial communication with the Radio Shield is at 4800 baud. Use Serial.begin(4800); to achieve this. All commands start with a single character and end with a CR/LF. Note that pin 16 of the LCD interface does not connect to any other circuitry on the PCB. Some LCD panels may require this pin to be connected to ground. If your display's backlight does not turn on when power is supplied to the Arduino and RadioShield, you may need to ground this pin - check your LCD's datasheet to be sure. V Reports version. Added in firmware version 1.1. The following blocks of code are provided as a starting place for your experimentation. This code sample displays a counter on the LCD. 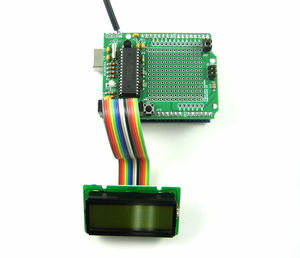 This demo receives incoming packets and displays them to the LCD. Note that there is no line length limiting - displayed packets may wrap strangely depending on the size of your display. This demo will transmit a simple test message about every 30 seconds, with an incrementing counter for each message sent. Serial.print("\r\n");                                     //    ...SEND CR/LF TO COMPLETE AND TRANSMIT PACKET. Note, the delay() is not from the end of the APRS packet, but from the time the transmit command (!...\r\n) was issued. If the APRS transmit takes 1 second to transmit and you are delaying 30sec, the next packet will transmit 29seconds after the previous. This is rarely an issue, just something to keep in mind if you're watching the clock. Firmware revision 1.1 - Released 4/23/2013. Fixed buffer overrun bug in (P)ath command that could cause configuration to become garbled and possibly set permanently to 300 baud mode. Added (V)ersion command. This page was last modified on 27 January 2016, at 12:54. This page has been accessed 106,655 times.